All Herbs are grown pesticide-free, and comply with the most stringent international quality standards "ISO9001, EUREP-GAP & GLOBAL-GAP". Our company are an agricultural growing and selling fresh green herbs for export from years. Based in benefiting from a unique climate and lush lowlands of the region enable the company to grow and supply fresh green herbs all over the year. "The king of herbs". Best known as a culinary herb prominently featured in italian cuisine, and also plays a major role in Southeast Asian cuisins. One of the main ingredients in pesto-a green Italian oil-and-herb sauce. The fresh herb can be kept for a short time in plastic bags in the refrigerator, or for a longer period in the freezer, after being blanched quickly in boiling water. Dill Fresh leaves are widely used as herbs in Europe and central Asia. The leaves are used to flavor many foods such as gravlax (cured salmon) and other fish dishes, borscht and other soups, as well as pickles. Dill is best when used fresh; however, freeze-dried dill leaves retain their flavor relatively well for a few months. Also known as cilantro or chiness parsley. The fresh leaves and the dried seeds are the parts most traditionally used in cooking. Coriander is used in cuisines throughout the world. The leaves have a worm, fresh, aromatic, sweet flavor with a cool after taste, beverages, jellies, syrups, candies and ice-cream. In Middle Eastern cuisine, mint is used on lamb dishes, while in British cuisine and American cuisine, mint jelly are used. Fresh leaves should e used immediately or stored up to a few days in plastic bags in a refrigerator. Optionally, leaves can be frozen in ice cube trays. 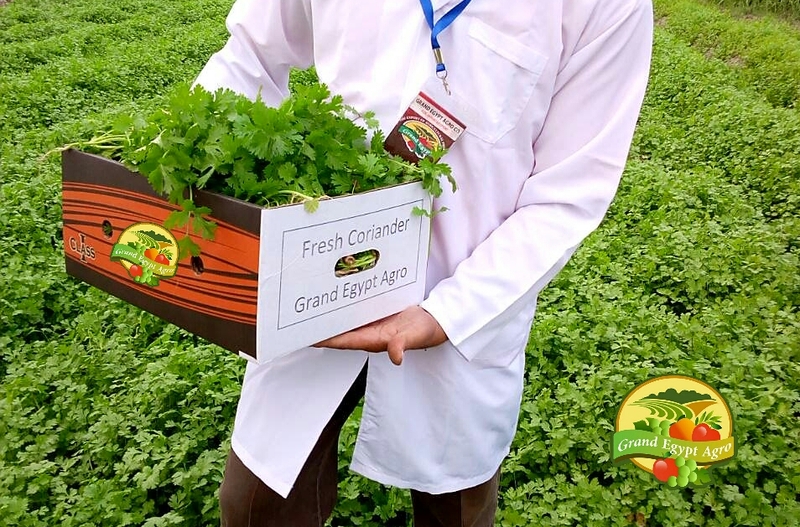 All Egyptians Herbarim fresh cut herbs are packed in micro-perforated bags inside food-grade carton boxes. Standard: 1 Kg package of 12-14 bunches of about 85 gram each. Loose: 1 Kg package, cut to length according to customer requirements. Other packaging solutions are available on request.